When Michael Quercio, lead singer, bassist, and founder of The Three O'Clock used the term "Paisley Underground" in an interview in 1982 to describe a particular slice of the Los Angeles music scene in the mid-'80s, little did he know that it would become a moment in rock and roll that would have significant historical importance. An amalgam of psychedelic rock, garage rock, and jangly, melodic pop, the scene was represented primarily by The Three O'Clock, The Dream Syndicate, Rain Parade, and the movement's most popular group, The Bangles. 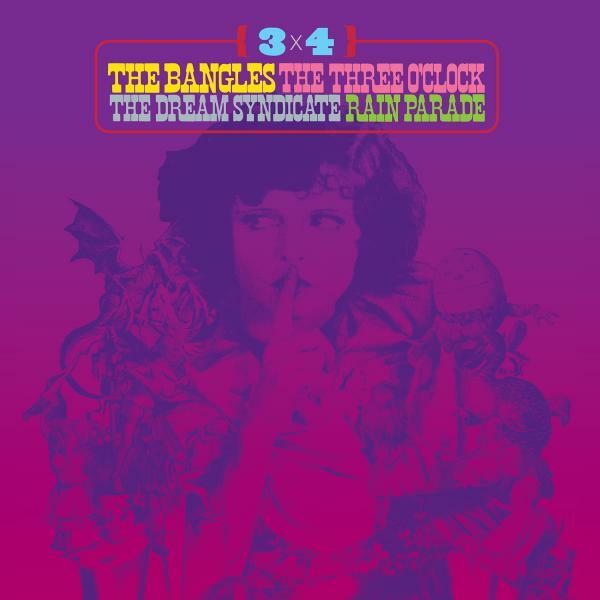 3 x 4: The Bangles, The Three O'Clock, The Dream Syndicate, Rain Parade is a new collection of cover songs revisited and reimagined by the bands who defined the scene. The 12-track collection, on Yep Roc Records, will have a limited release on Black Friday followed by a wide release on January 11, 2019. The concept for 3 X 4 was created by Steve Wynn (The Dream Syndicate), Vicki Peterson (The Bangles), and Danny Benair (The Three O'Clock). The admiration that each one of these bands had for each other, and the scene they created carries through on this loving appreciation. "We joke about it now," wrote Peterson in the album's liner notes, "but it really is like we went to school together. Paisley High, Class of '83." For this collection, The Bangles chose to record "That's What You Always Say" by The Dream Syndicate (from their classic 1982 album, The Days of Wine and Roses), "Talking In My Sleep" by Rain Parade (originally on the band's 1983 album Emergency Third Rail Power Trip), and The Three O'Clock's "Jet Fighter" (from their 1983 debut full length album Sixteen Tambourines). "There are so many gems on the Three O' Clock's Sixteen Tambourines we went back and forth a few times before deciding on 'Jet fighter,'" Peterson wrote. "The chorus is ridiculously catchy. We traded in the keyboards for guitars, but stayed close to the original version in other ways. I think Debbi (Peterson) tried not to sing with Michael Quercio's almost-British accent, but he's so bloody charming and we're all unapologetic anglophiles, too, so she just had fun with it."